It’s time to take advantage of a new graphics bundle. 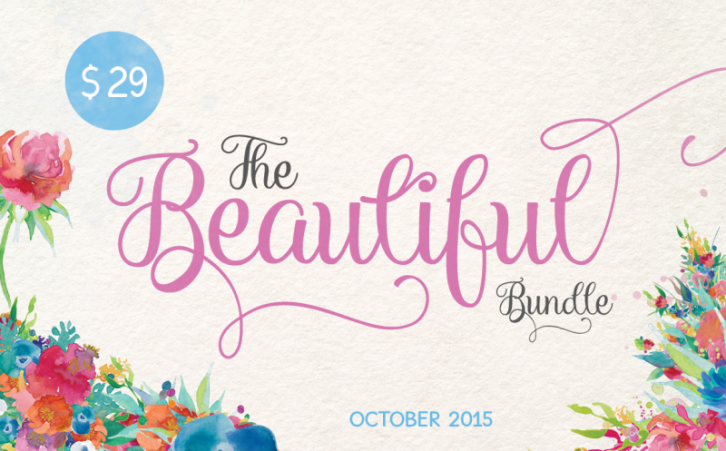 The October bundle is also known as “The Beautiful Bundle”. There are some amazing fonts and graphics throughout this bundle and it’s priced at only $29. Front Minty Font Brush Typefaces to the Secret Garden, you will be able to create some gorgeous graphics. Cursive and hand written fonts are becoming very elegant and can be used across a wide array of industries. Instead of having to purchase all of the fonts individually, you will be able to have a total of 33 fonts included within this bundle. This provides you with more diversity than what you have installed on your computer. Banners, ribbons, dreamy florals, decorative frames, and more are included in this beautiful bundle. Whether you are creating book covers, marketing for a floral shop, preparing for specials for birthdays, Mother’s day, spring, or anything else, you can find the graphics you want. With the combination of the 33 fonts and 19 graphic packs, you save a total of 96%. This is an incredible deal and it’s only available from October 1 through November 1. Download the bundle today so you have an arsenal of more graphics than ever before.